Our son with food allergies took a home school cooking class at the YMCA one time, and to our surprise, the teacher had her own food allergy child in the class as well. So the recipes the kids worked on were allergy-friendly! It was awesome! You just never know when you’ll meet fellow food allergy friends, right?! Over the course of a few weeks, the kids created allergy-friendly brown sugar popcorn, stain-glass cookies, and energy bars. 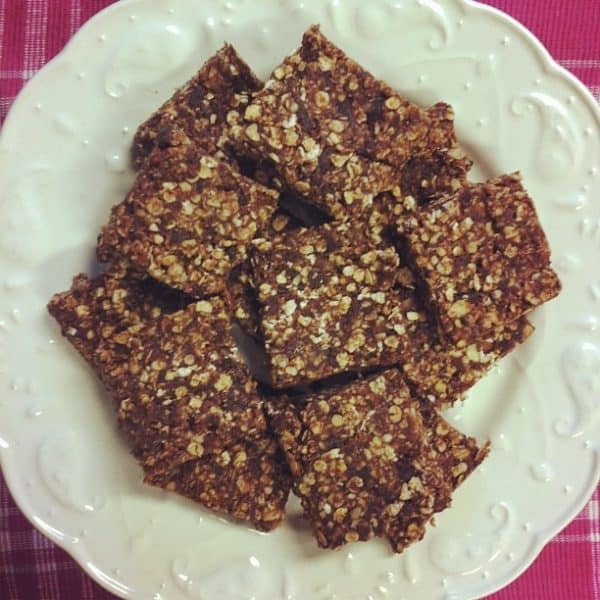 I couldn’t wait to share this energy bar recipe with you! These bars are super easy and no-bake, the perfect recipe for kids to take on themselves. We added chocolate chips (affiliate). Other possible add-in’s could be seeds, nuts, raisins, etc. Here’s the recipe below. Now let your kiddos take over the kitchen, mama. And you just sit back and enjoy. Mix all the ingredients well. We flattened the mixture into a cake pan, refrigerated, and cut into bars. You can cut them into shapes, roll it into balls, flatten them into discs. The options are endless on how to serve these. I am keeping ours refrigerated. These look great! We will have to try this out! aside from enjoy life snack bars…its hard to find peanut, treenut, dairy free ones. besides, my daughter will have fun making them! thanks again.